Off our immediate coast there is history both above and below the waves. 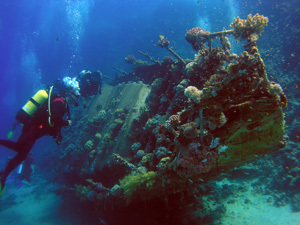 The most evocative is the wreck of the Falco Blanco Meridiano, a major ship of the Spanish Armada’s fleet. When King Phillip of Spain decided in his wisdom to attempt to wrest England from the hands of Elizabeth 1st., a heretic and daughter of an illegal marriage in his eyes, so began the building and provisioning of the Spanish Armada. When eventually the two sides met, the Spanish fleet was famously defeated by the English Navy under the command of Sir Francis Drake which then fled northwards to find a route home to Spain. Their ships and galleys encountered a very hostile shore and even more hostile weather. Many of the fleet were wrecked as they fought their way up the East Coast of Britain and then Scotland and having turned westward to the Atlantic, more vessels were lost as they made their way across the north coast of Ireland before turning for home having rounded the coast of Donegal, our most north-westerly county. The larger vessels of the fleet attempted to make their way out further into the Atlantic to ensure a sufficient distance to safe guard them from being blown onto a lee shore, but there were inevitably casualties here as well. For our stretch of the Irish coast this involves three ships one of which was the Falco Blanco Meridiano which has a number of resting places according to whomever one speaks to. We all have our theories as to where the remains lie but they do indeed lie right here. In more recent times we have seen both commercial and private vessels going down off these shores. The Guinness family yacht on passage from Galway city northwards struck the Blood Slates, an infamous reef off the Killary. Legend has it that a submarine was scuttled or sunk in the Killary or its environs. The Killary again surfaces as an extraordinary location when it played host to the British Atlantic Fleet in 1916. The largest warships belonging to the most powerful of the world’s navies sailed up this narrow waterway to show the flag while King George V was visiting Ireland. Again off the island of Inishbofin another Royal Navy ship met it’s end when the H.M.S. Barrister went down having been struck by a German torpedo in the last war. Off the west side or back of Clare island there is a B17 bomber, this type is better known as the Flying Fortress, which crash into the sea there while on its delivery flight from the USA to the UK during W.W.2. So this area displays its past. From deserted island village on Inishark, to site of pilgrimage on Caher Island, old ruins on Crump island and more to be discovered as was proven recently when and ancient anchor was discovered on a reef a short way out from the main coast. We will take you to these places and relate to you our past.